The two main types of ELECTRIC BRAKE ASSEMBLIES for axles 7K and below are Forward Self Adjusting (FSA) and Manual adjusting. The difference between the two is that the forward self-adjusting brakes will adjust themselves as needed so that they are always at the optimum position. Manual brakes must be adjusted manually via the star adjuster on the back side of the brake assembly as needed. Due to the reduction of required maintenance, the FSA brakes are becoming a lot more popular. It is important to be able to identify which type is already on your trailer so that maintenance or replacing is done correctly. This cannot simply be done by looking for a star adjuster because both types have that. The FSA brakes will have a wire that will run from about 9 o’clock to 1 o’clock. On the 1 o’clock side it will have a banjo looking fitting (shown to the left). 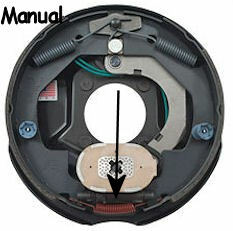 The manual adjusting brake will not have this wire running across the inside of the assembly. Another way to identify between the two is the bottom spring. 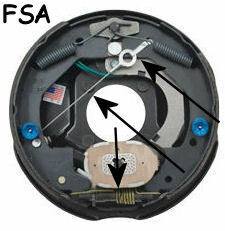 On an FSA brake assembly (shown above) the spring will be straight and wrapped around the adjuster. On a Manual adjusted brake assembly (shown to the right) it will be a curved spring below the adjuster. Due to the way that these brakes operate we absolutely recommend being consistent through the trailer. It is NOT SAFE to run both types of brakes on the same axle. It is NOT RECOMMENDED to run both types of brakes on the same trailer (different axles) but if the brakes on each axle match, it is operable. Problems will occur if one side of the trailer is adjusting automatically and brakes on the other side are not. A final thought about FSA brakes assemblies. It is important to keep in mind that FSA brakes are automatically adjusted to perform at their best. This means they may not last as long as manually adjusted breaks. This is because manually adjusted brakes, if not adjusted regularly, are not being used to there potential and the shoes wear slower.